The courts have power to hear and determine disputes, primarily of criminal and civil nature. Criminal cases are those in which the State prosecutes a person or an organization for committing an act which is not in the interest of the public, and therefore considered to be an offense against the State. Civil cases originate from a person who seeks redress for a private wrong such as breach of contract, trespass, or negligence; or to enforce civil remedies such as compensation, damages or to stop some action. 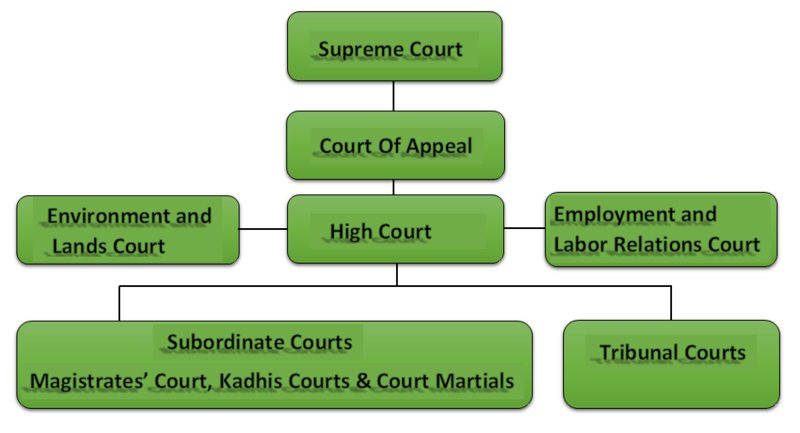 The courts under the Constitution operate at two levels, namely; Superior and Subordinate courts. A court to hear matters concerning the Environment, and the use of, occupation of and title to land. The Supreme Court is the highest Court in the Judiciary while the lowest Court is the Magistrates court. The court hears and determines cases relating to presidential elections. It hears appeals on cases that have been concluded by the Court of Appeal, issues advisory opinions on matters concerning County Governments, in any cases involving the interpretation or application of the Constitution and in matters of general public importance. Further, the Supreme Court hears appeals from any other court or tribunal as prescribed by national legislation and determines the validity of a declaration of a state of emergency. The Court Martial hears cases involving people serving in the Military. They are established under the Armed Forces Act.